The first Medusa that I built, was done purely on a cut and fit basis, and a lot of TLAR (that looks about right) engineering. For the second one I built, I decided to actually make templates. The five plates labeled 'Top', 'Rear', 'Front', 'L', and 'R' make up the box on the back of the vehicle. I extend the bottom of the chassis to hold this box with a extra one of the bottom plates from the chimera chassis, cut right at the angle. 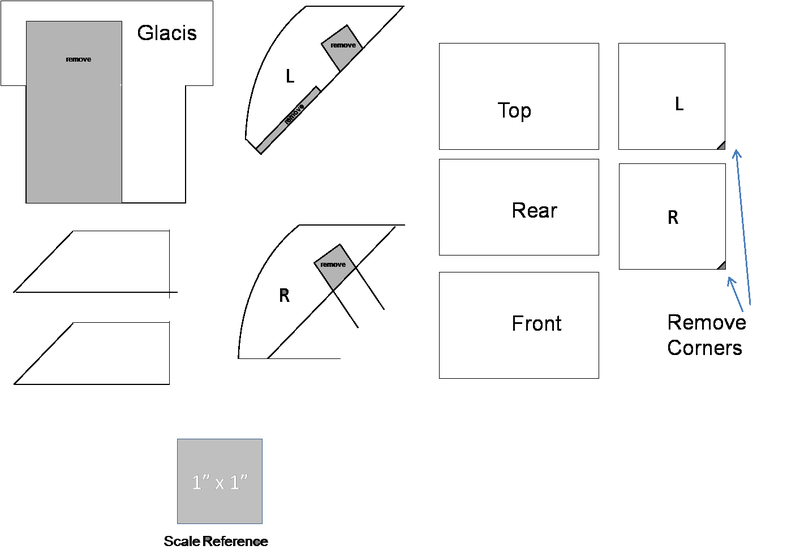 The large plate labled 'Glacis' is serves to align all of the plates that will make up the front of the vehicle. The front itself is made by cutting up the front 'cabin section of the chimera hull. The plate which holds the hull heavy weapon is separated from the top and the 'drivers' plate. This bit is glued into the hull in the provided spot to set the angle of the glacis. The big glacis plate, above is glued to the back of the weapon plate as the backbone for the rest of the front plates. I cut the top of the heavy weapons plate free just to the left of the left hinge. I left the entire driver's section intact. The driver's section will on top of the right side of the glacis. 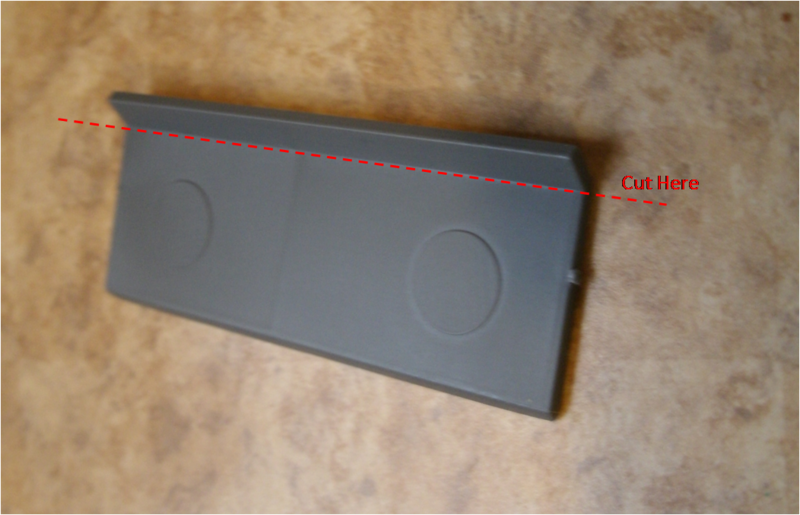 Note that you will need to cut out part of the back of this section to fit over the treads/track-guard. There will be a 'cut-to-fit' plate between the hull-weapon plate and the driver's plate that I didn't template. I also used another one of those spare plates from the chimera hull to make the plates on the left and across the top. The top and back of the hull that went over the hull weapon become part of the removable enclosed crew compartment. These pieces are cut-to-fit but are pretty simple -- the hard stuff is templated. I originally put this one together the night before the NOVA open, so it didn't get detailed the way I wanted it to. I've stripped it now so that I can do the rivets, etc. Here you can see how the plasticard mates up with the GW parts. Even though this one was built in more of a hurry, it actually has a better fit as a result of my returning to the more 'engineered' templated approach. So now I can add the rivets that I neglected before in the interests of time, and clean up some trim pieces that ended up a bit crooked. Hmm... I might have to build a Basilisk (or two) based on this pattern.